The Gulf Centre for Human Rights (GCHR) announces its full solidarity with the campaign to end the male guardianship system of women in Saudi Arabia. GCHR believes that there will be no real reform and development in the country without women being able to take a leading role in building the society. In Saudi Arabia, women can’t take this role under the current legislation which deprives them of access to their basic rights such as education, mobility, work, choice of residence and obtaining the necessary medical care. The roots of the male guardian system (Wali) emanate from the Saudi laws and legislations that are derived from radical religious views. These views justify that women need permission from their male guardian (typically a father, brother, husband or in some cases the son) for education, having a passport, leaving the country, working, having an abortion if pregnancy puts their lives at risk, being released from jail or rehabilitation centers, or marriage. Despite the fact that the labour system no longer requires the approval from the male guardian before women may access any job, a large sector of employers are still demanding women to have this approval. However, the authorities do not hold those employers to accountability. In addition, women are not allowed to drive and there is no public transportation to facilitate their movement. The campaign to end male guardianship in Saudi Arabia received widespread support across the country, and thousands of social media users joined the campaign #IAmMyOwnGuardian. Women activists submitted thousands of letters to the King of Saudi Arabia to end the country’s guardianship system. Another petition to end the guardianship has been signed by 15,000 people (men and women) and was submitted to the king. 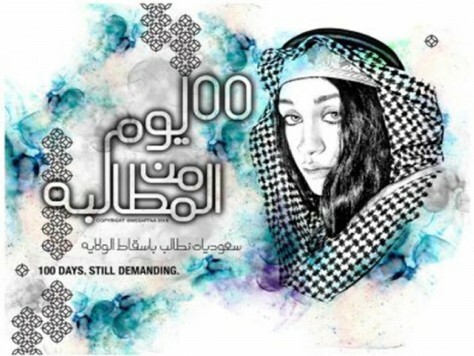 Human rights defender Maryam Al-Otaibi, a prominent activist on social media, was rebuked by her brothers for her engagement in promoting the campaign. Al-Otaibi asked the authorities to protect her from domestic violence. In return, her father filed a disobedience (uqouq) case against her which led to her detention in the women's prison. Al-Otaibi had to drop her violence report against her brothers, in order for her father to drop the disobedience case against her – one of the crimes that requires detention according to Saudi law. According to newspaper reports, another female activist was detained for months before being released after publishing a public apology in newspapers for participating in the campaign. Newspapers also reported that a male activist was handed a conviction of one year in prison and a fine of $8000 USD for supporting the campaign. Stop prosecuting all citizens (women and men) for demanding their civil rights, and ending all punishment for peaceful activism.